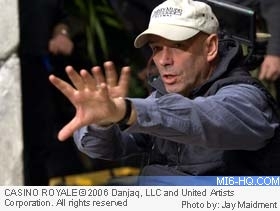 New Zealand-born helmer Martin Campbell (pictured below) holds a unique place in the 007 canon, being the only director to introduce two new James Bond's to the big screen. First was Pierce Brosnan in 1995's "GoldenEye", after the franchise had been on hiatus for six years and nobody knew if it could return to its past heights, and secondly with Daniel Craig in 2006's "Casino Royale", when 40-years of history was thrown out in order to reboot the series back to Bond's literary roots. Promoting his new Mel Gibson movie "Edge of Darkness", which Campbell has reworked his from his television mini-series, the director has reflected on the risks and rewards that come with introducing a new 007 to the world. Speaking to the Guardian newspaper, Campbell looked back on successfully launching Brosnan and Craig: "Timing was more important on both movies. With GoldenEye, the franchise got locked into this legal fight. They couldn't make new Bond movies for about seven years. It was my first huge production. I figured if I did at least a yeoman-like job, it would be greeted as a complete revival of the series." It was, and he invited back 10 years later to welcome Craig in to the franchise. 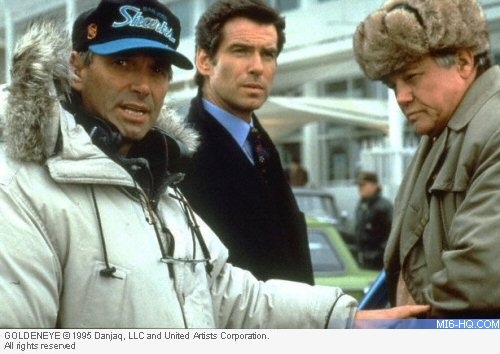 Above: Martin Campbell with Pierce Brosnan and Joe Don Baker filming the St. Petersburg meet (actually at Epsom Race Course in Surrey, England). "The producers felt it had gone off the rails a bit after Die Another Day, with invisible cars and all that. I told them, we have to go back to the books. We even discussed doing it as a period piece." He laughs. "We settled on a more fucked-up character with a dark streak in him – drinking too much, dodgy liver – all that's in the book. In Casino, he also had a real relationship with a woman. He doesn't just have a dozen for king and country." The key to Campbell's interest in returning to Bond was the prospect of an origin story. He explained to ReelzChannel: "Casino Royale of course was an opportunity to go back to the tone of the books which they never were in the original movies. They never have been. Even the Sean Connery movies are not in the same tone as the book. I was lucky enough to have an origin story." 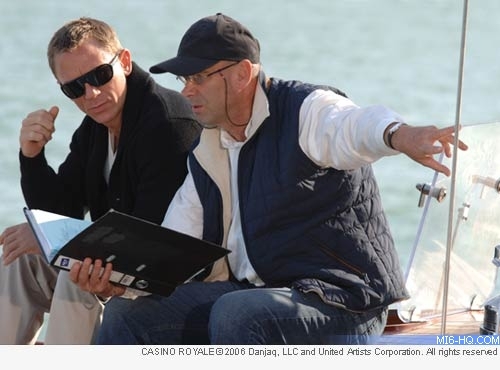 Above: Martin Campbell and Daniel Craig between takes in Venice. "Bond really doesn't become Bond until the last frame of the movie. He's a fucked up guy. He's a guy who smokes too much. He doesn't smoke in the movie but in the books he certainly smokes too much, he drinks too much, he abhors a certain kind of violence when it's very messy and ugly. It's something he hates. He finally shoots someone in the forehead with a bullet, but the bathroom scene is very distasteful and ugly and clumsy and messy." "So there are elements to Bond, and of course a great relationship with the girl which allowed you the one meaningful relationship in his life apart from On Her Majesty's Secret Service where he marries the girl. So that was a really great opportunity to get into the tone of the books and make him a much darker, more fucked up character which was way more interesting in my opinion."